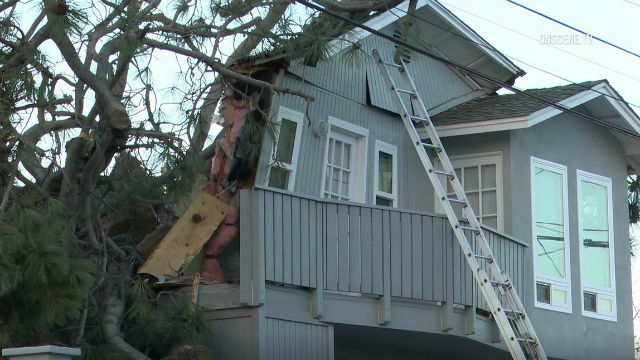 Two people were killed Monday when a roughly 75-foot-tall tree fell onto a two-story house in the Point Loma Heights area. The tree fell around 6:15 a.m. at a home near the intersection of Santa Monica Avenue and Santa Barbara Street, San Diego Fire-Rescue Battalion Chief Rick Ballard said. Both victims were pronounced dead at the scene, Ballard said. The Grand Forks Herald in North Dakota reported the two were Jessica and Troy Nelson, a couple who lived outside Thompson, North Dakota. The Nelsons were the owners of Trojan Promotions and were in San Diego for a trade show, according to the Herald. One other person was inside the home when the tree fell, but was able to make it out, Ballard said. The Herald reported the person was Jessica Nelson’s brother, Ryan Langerud. The home the three were staying in appears to have been a vacation rental — the website VRBO.com has a listing for a home that matches the one involved in the tree fall. The listing for the 1,000-square-foot, two-story house has almost 80 reviews on it. A phone call to the person named as the owner went unanswered. San Diego Gas & Electric crews were called to the scene to repair some downed power lines and shut off gas to the home, Ballard said.